The week long itinerary starts off with shorter days to get the legs going and becomes progressively more challenging. 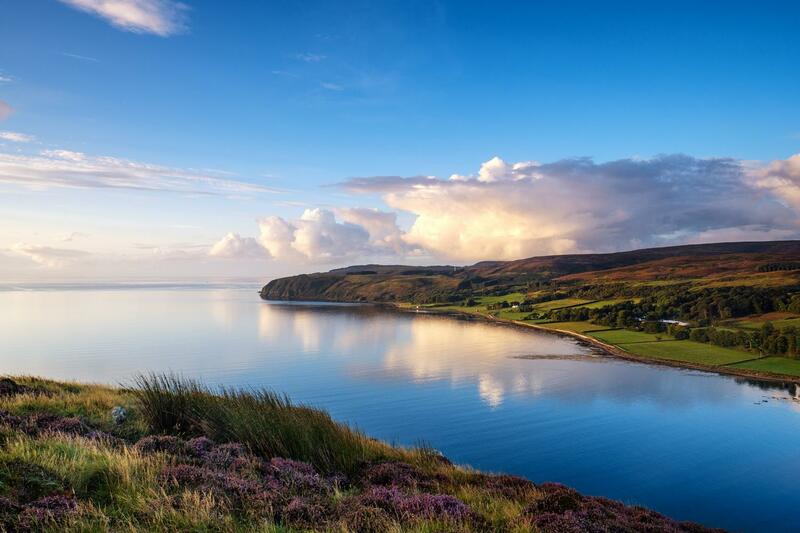 The remote Kintyre peninsula on the West Coast of Scotland is a hidden gem waiting to be discovered. What better way to discover the ruined castles, rich wildlife, fabulous local seafood, welcoming hotels and magnificent scenery than on foot. 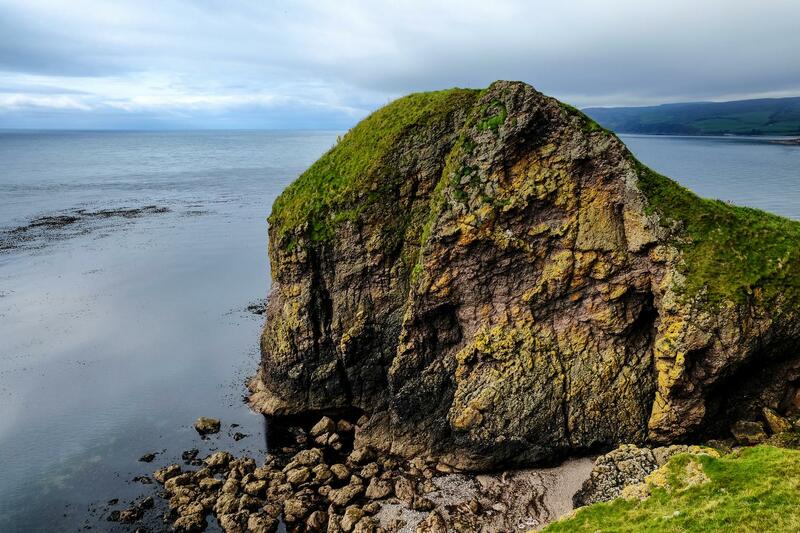 The Kintyre Way stretches the length of the peninsula, which feels more island than mainland. 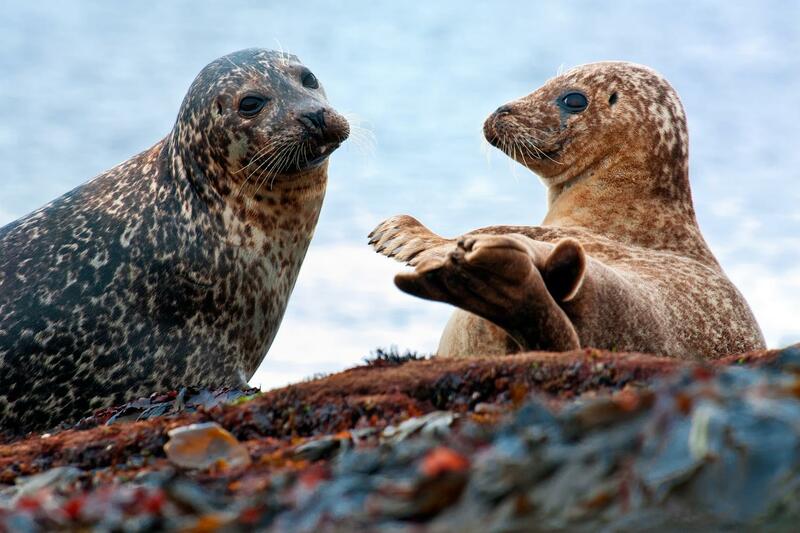 This 160 km / 100 mile self-guided walking holiday allows you to explore the quiet and hidden places of Argyll, small local fishing villages, see the crashing Atlantic waves and rich wildlife (including otters, seals, seabirds and perhaps a basking shark) of the Kintyre Peninsula. Every holiday we offer features hand-picked overnight accommodation in high quality B&B’s, country inns, and guesthouses. Each is unique and offers a warm welcome, atmosphere and local cuisine. We include daily door to door baggage transfers, a pre-departure information pack and access to GPX tracks and detailed mapping with our Macs Adventure smartphone app, as well as 24/7 emergency support, should you need it. Evocative ruined castles, great views and wildlife filled loch side walking make for a rewarding first day on the Kintyre Way. 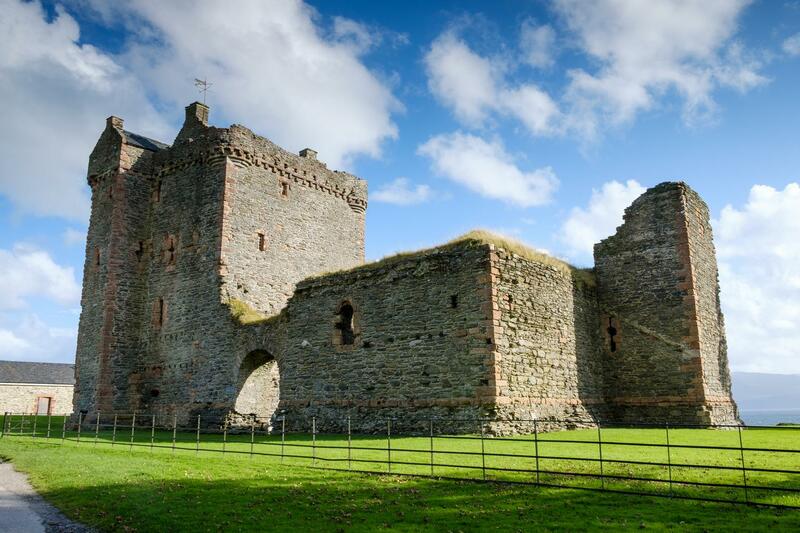 Begin by visiting the ruined Tarbert Castle that dates back to the 13th century, then after some rewarding climbing you will also pass the ruins of Skipness Castle. The Seafood Cabin at Skipness Castle serves excellent local seafood (open Sun-Fri 11am-6pm closed Saturday) and is a recommended lunch stop. A pleasant loch side section brings you to the end of the first section on The Kintyre Way. There is nowhere to overnight in Claonaig so we arrange for a taxi transfer to either Tarbert or Clachan if you are not continuing to Clachan. On this section cross the peninsula for the first time - and what a section it is! Coastal and hill walking, peaceful hill lochs and wonderful views of Arran, Islay and Jura all combine to deliver a great stretch of walking. Overnight: Clachan, a small village with small shops. After the undulations of the stage before it’s time to enjoy the delights of coastal walking as you follow the shoreline south to Tayinloan. This lovely stretch of coast is a birders delight and enjoys beautiful views across the Sound of Gigha to the Inner Hebrides. 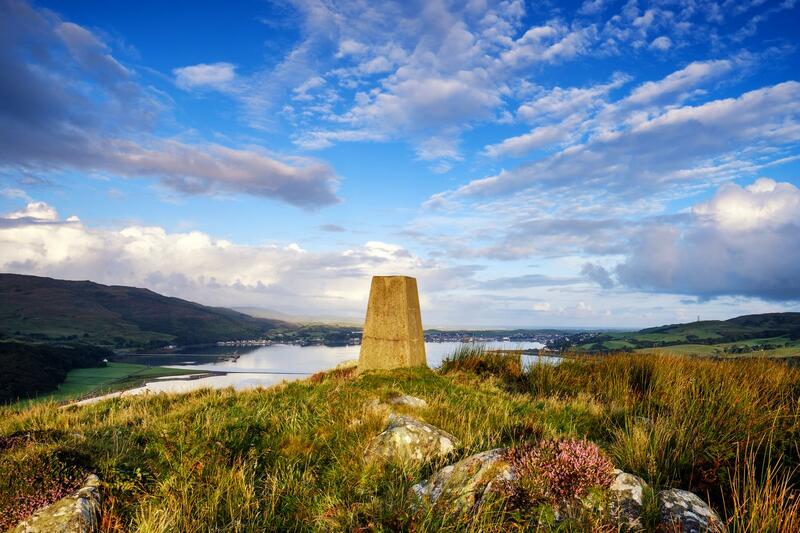 Brace yourself for a varied and rewarding second traverse of the peninsula as you head east to the lovely village of Carradale. The Way passes through a mix of farmland and forestry as you meander up and over the peninsula. Overnight: Carradale, a lovely village with a range of services and accommodation. After the hospitality enjoyed in Carradale revel in the coastal scenery enroute to Torrisdale Bay, followed by a road section to Saddell Bay bringing you to the 12th century Abbey and 16th Century Towerhouse. Then walk inland for ~8 km through forestry to the attractive Lussa Loch. This section ends at the Southern End of Lussa Loch where your taxi will meet you to take you into Campbeltown for your overnight’s accommodation if you are not continuing to Campbeltown. The extra 9 km of road walking from Loch Lussa to Campbeltown is optional. Overnight: Campbeltown, Kintyre’s largest town with a population of approximately 7500. Before leaving Campbeltown you might like to visit one of the whisky distilleries in the town centre. Then follow a minor road around the southern end of the Kintyre Peninsula, after some steady climbs gain wonderful views of the Davaar and Sanda islands. On a very clear day you may see all the way to the north coast of Ireland! Finish the section with a lovely coastal section following quiet sandy beaches with a little rock hopping involved. The final stretch leads inland following small roads and farm tracks until reaching Southend. From Southend your taxi will take you to your accommodation in Campbeltown to overnight. Undoubtedly the toughest, but also the most rewarding part of the walk, this section passes through remote and challenging countryside. Great views dominate and provide a spectacular finale to your trip. After your morning taxi transfer from Campbeltown to Southend pass Dunaverty Rock and follow sandy beaches, then quiet coastal roads between remote farms to head inland. Soon the route ascends and crosses undulating moorland before rejoining the coast to continue along cliff tops above the crashing waves of the Atlantic Ocean. A final ascent and crossing of open ground sees you arriving in Machrihanish and the end of the Kintyre Way. 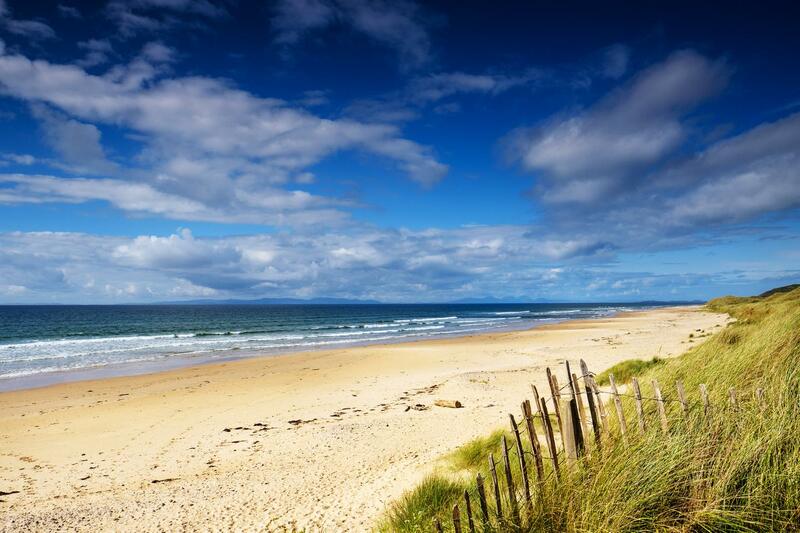 Overnight: Machrihanish, a coastal village on the edge of Machrihanish Bay's long stretch of sandy beach. 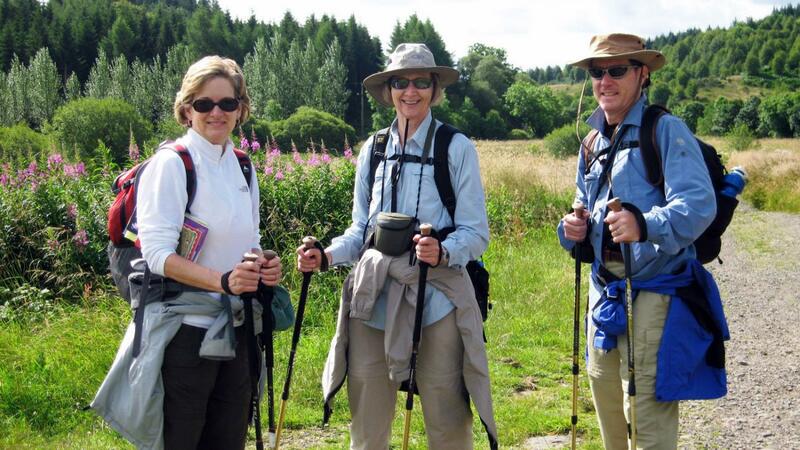 One of the highlights of this walking holiday is the high standard of the accommodation you will enjoy. The hotels, inns, guesthouses and B&B’s we use are hand-picked to ensure that you enjoy every minute of your stay. All offer a warm welcome to walkers, traditional hospitality and delicious local food. We do recommend that you book this trip early as the area is always popular and the hotels and inns do fill up early, especially in high season. You will find descriptions, photos and weblinks to a selection of the accommodation below. This independent walking holiday is not available to solo walkers but if you require single rooms within your party we will of course try to accommodate your request subject to availability. Many of our clients choose to add extra nights along the walk and these can be added at the time of booking. Dunultach provides Scottish Tourist Board 4 star Bed & Breakfast facilities in an unspoilt rural location on the Kintyre peninsula, with stunning views over The Sound Of Jura. Ferry Farm Bed and Breakfast sits on the beach overlooking the sound of Gigha with some of the best views towards Gigha and beyond to Jura and Islay. Set in its own private garden, with views across to the Isle of Arran, the centrally heated hotel has comfortable rooms all with colour television, tea & coffee making facilities and en-suite bathrooms. 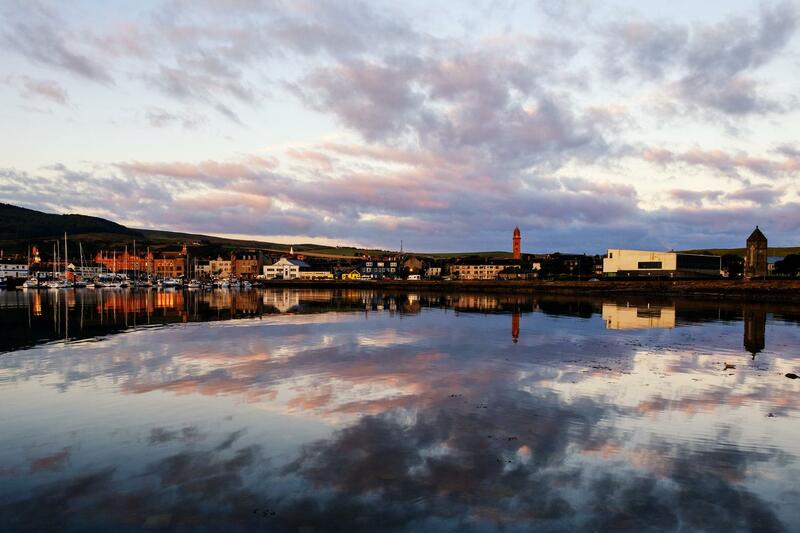 Located on the shores of the world famous Campbeltown Loch our premises offer arguably the best views of Campbeltown. Douglas Lodge is situated in the beautiful village of Machrihanish and is only two minutes walk to the world famous Machrihanish Golf Club. This tour is offered from March to October. The best time of year to visit Scotland is from early-April to late-September when the weather is best, most attractions are open and the days are long. Ferries operate less frequently in winter and arrival days may be different so please check summer and winter timetables to check what suits you best. The weather is very unpredictable all year, so it's best to be prepared for wind, rain, cold, warmth and sunshine! Conditions (and forecasts) can vary substantially from one day to the next, so do anticipate a variety of weathers, and embrace them as the Scots do (with a good waterproof and windproof jacket on). 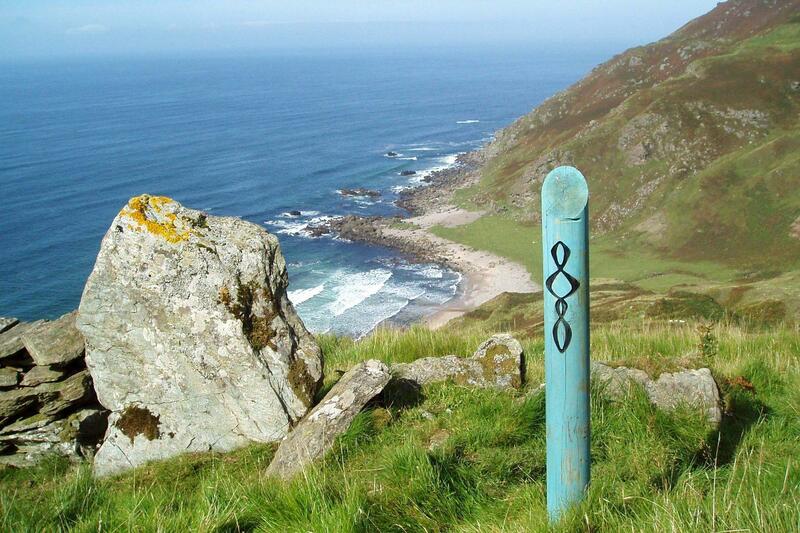 The Kintyre Way is a National Trail and is fully way marked and easy to follow. A detailed information pack, and access to GPX tracks and detailed mapping via the Macs Adventure smartphone app (including print outs) is provided. The route on the Kintyre Way after Campbeltown was changed in early 2018 by the authority that manages the trail in an attempt to minimise road walking and include more coastal landscapes. If you have a guidebook you plan on using do make sure it refers to the current route. We have already updated our route notes to match the newly way-marked route. The terrain underfoot varies from tarmac roads to trackless moorland, forest and farm roads, specially constructed paths, rocky shores and sandy beaches. The paths and tracks are mainly well drained, and the main boggy sections, depending on the season and recent weather, are likely to be between Claonaig and Clachan, and at various places between Machrihanish and Dunaverty. Your bags will be collected from your accommodation each day and moved onto your overnight accommodation. We ask you to limit your luggage to one bag of up to 15kg per person. 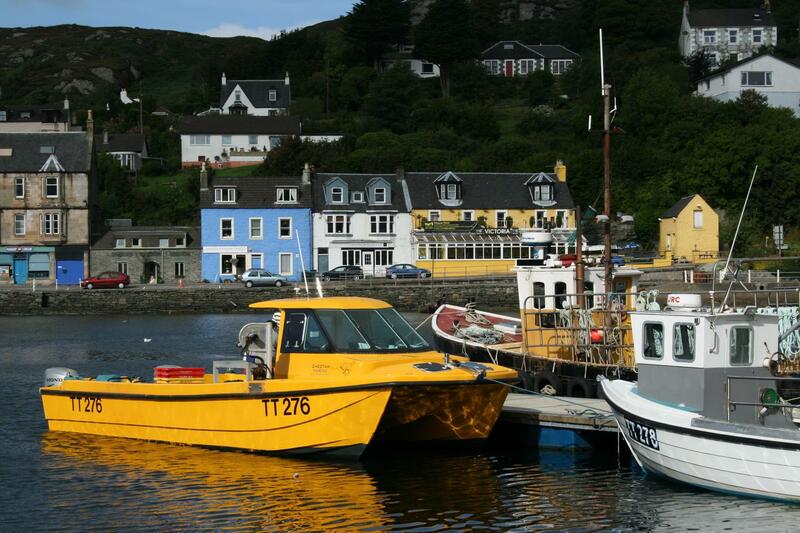 Tarbert is 95 miles by road from Glasgow in Argyll and Bute. By car the journey from Glasgow takes 2.5 hours and parking is available in the village. The village is served by a regular Citylink Bus services from Glasgow to Campbeltown. From the end of the walk at Southend take a taxi or local Bus (Operated by West Coast Motors) to Campbeltown and then the Citylink or West Coast Motors Service back to Tarbert or all the way back to Glasgow. Planning a trip on the Kintyre Way can be daunting, especially if this is your first long distance walking holiday. We are often asked the following questions and I hope that you will find the answers useful. Please don’t hesitate to contact us or perhaps visit our walking forum for more advice from our clients and team. At 89 Miles the Kintyre Way is a fair distance and the higher your level of fitness the more you will enjoy the experience. Most of our itineraries involve between 5 and 10 hours walking daily so you should be comfortable walking on good tracks and paths over undulating terrain for at least 6 to 7 hours. If you currently don’t enjoy that level of fitness regular walking in hilly terrain supplemented by cardio vascular exercise for at least 6 months prior to your walk is recommended. A good gym or personal trainer will be able to draw up a personalised training programme. We suggest you book as soon as your plans are finalised as the Kintyre Way is extremely popular especially over April/May and July/August. You will find up to date availability on our website and we will always try and accommodate your plans. Traditionally April/May has always been the most popular time of year because the theory goes that the weather is better and the midges have not yet appeared. Although having walked the way in every summer month I believe any time between late March and October offers a wonderful experience. 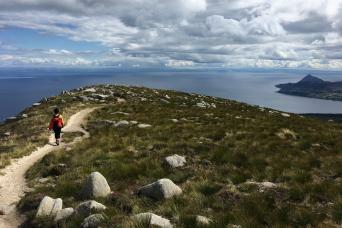 We had a wonderful experience walking the Kintyre Way in Scotland. The hosts at the various places we stayed along the way we're very helpful, gracious and welcoming. The trail had a variety of terrains that you walk from farm fields, beaches, dirt pathways through forest area and highways. The latter was the least enjoyable. Unfortunately we arrived during a rainy period of time. However, we were prepared with appropriate rain gear, wind breakers, hats and gloves. In spite of the weather we had an amazing time walking. The satellite GPS app my boyfriend was able to download helped to keep us on the correct path. I would highly recommend getting it if you chose this hike as some of the way finding post are hard to see or find. If you start at the north end of the trail and go south be prepared for long days of walking on the last two days. I wonder if it would be better to walk from the south end and go North. Our taxi driver who transported our luggage was amazing! He gave us some great advice along with the hosts at the places we stayed. I would definitely recommend the trip to others. Despite being experienced outdoor adventurers, our trip on the Kintyre Way was our first long distance footpath and we chose it because it did not seem to be as popular as, say, the West Highland Way. In fact, we met no other walkers at all. Our overall experience was positive apart from the first day. Torrential rain and totally washed out footpaths on that day coupled with the amalgamation of two legs of the journey into one made for an exhausting start to our trip. However, friendly accommodation and improving weather thereafter made for an enjoyable remainder of the trip. Our strong recommendation is not to combine the first two legs from Tarbert to Clochan but to split this at Skipness or Cloenaig. Our hosts in Clochan offered to provide transport if accommodation is unavailable in either of these places. In addition, we would recommend that careful consideration is given to the nature of the last day. It is a serious challenge to complete this (Machrihanish to Southend) in time for the public bus back to Campbeltown particularly since breakfast at the superb Ugadale Hotel in Machrihanish is relatively late. We both agreed that returning to Lussa Loch simply to walk the road to Campbeltown that we had driven the day before was pointless. We readily accepted our driver's recommendation that we walk the length of the beach North of Machrihanish to the Ugadale Hotel instead. He was a font of local knowledge and both helpful and entertaining. The Ugadale Hotel was the highlight of our accommodation with the other accommodations being very comfortable. However, the Carradale Hotel and the Gigha Hotel are both rather "tired". Finally, while the route is very well signposted with little chance of losing one's way, the underfoot conditions are, at times, difficult. On our first day there were numerous occasions when the path was knee-deep in flowing water or at least ankle deep in glutenous mud. The walk was challenging under foot. The scenery was great. The people met were friendly. It was very quite and serene. Days 4 and 6 were painful to the feet. Day 4 was virtually (except for the last 2 miles) coast to coast on hard rocky construction roads - boring. Day 6 was half on small quite road and half on busy main road coast to coast. Beautiful diverse terrain, and lots of sheep. The trip was wonderfully organized, with no logistical issues in the arrangements or baggage transfers. Kintyre was beautiful with diverse landscapes and terrains, from beach to moors, to muddy bogs, to forest roads, and a wind farm. The accommodations were all fine, and the Dunvalanree in Carradale was exceptional. The trip is pretty intense--nobody we met along the way finished the whole thing. But in the second half of the week we were able to take a bus to skip some miles. It was really nice to have that option. Some minor things that can be improved: Day 4 for whatever reason is super intense and exhausting. The itinerary says we are to be picked up at mile 14, but the taxi waits at mile 17--on a difficult day, those extra miles looking for the taxi are seriously demoralizing. Also, we spent out final evening at a b&B three miles away from the nearest food. It would have been great to know that we needed to pack our dinner or walk three miles into town.--luckily we took the bus for some of our miles that day so didn't mind doing an extra 6 miles to the pub and back for dinner, but had we walked the whole thing and then needed to walk to dinner, I am sure I would have been in tears. But overall, the trip was amazing and beautiful, and I would absolutely recommend Mac's Adventures as a tour organizer. We chose the Kintyre Way for our first long distance walking holiday, partly because it is newish and therefore much quieter than the West Highland Way. But also because it seemed a less challenging route for first timers (fewer hills!). Kintyre is a spectacular peninsula in Scotland, offering views of Arran down its East edge and Jura and Islay from the West. The sea is clear, sandy beaches, azure waters. And the people we met - every single one of them - were welcoming, friendly and helpful. Finally, admittedly somewhat to our surprise, the food was amazing too! Lots of excellent fresh seafood. Vegetarian options not bad either So to the walking... Mixed weather en route. The path is really well maintained though, and clearly improvements have been made (e.g. The guide book from Coarsaig to Clachan suggests a boggy walk, but the path has been raised a bit making it a delightful walk. Some of the road sections have also been rerouted through more scenic routes. That said, there is still a fair bit of road walking - forest tracks as well as B roads. We don't mind the former, but some walkers won't like the forest routes. Ironically, on our day off on the lovely isle of Gigha, one of us sprained our ankle coming down the stairs of the Gigha Hotel - meaning that we had to cut our walking short - we made it to Carradale. So we can't comment on the route thereafter. However, we are determined to return and start where we finished, which says something about our feelings for the Kintyre Way. Macs provided an excellent service. On the whole, the accommodation was good - and the variety added to the adventure! The baggage delivery people were brilliant. We had absolute trust in everything going to plan and it did (other than the sprained ankle!) We would recommend both the KW and Macs to anyone. The route needs altering - too much boggy unpleasant walking. As all ground always wet, Kintyre Way should have occasional logs/benches to sit on for lunch breaks! The people and the food are great - enormous generosity and kindness. The Kintyre Way is challenging. Especially the last section by very strong wind. Accommodations are in general not very clean. An execption is the Dunultach BB in Clachan, Just a fantastic place to stay with an excellent dinner cooked by Liz. We started our tour on the Isle of Arran and made the Goatfell by fantastic weather - just great. We were missing the walks along the coast on the Kintyre way, too much forest without any view on the sea. this was a very good hard walk. Good hard walk, all the accomidation was good and frendly, the guest house at machrihanish was the only one not freindly they just could not be botherd,The argyill arms hotel at Southend would be a good last day stop right at the end of the walk and on the bus route. Enjoyable walking with a little too much walking on the road. We have changed the last part and walked (it is the other way around, but that doesn't matter)from Amod to Macrihanish, otherwise we would not have seen the best part: the Mull of Kintyre. Very helpful and freindly taxi service!! Getting out onto the Kintyre Peninsula is a great experience and one which you will not find anywhere else in Britain. 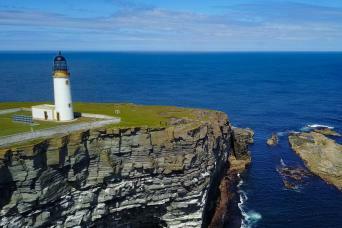 Rugged coastline, views over Islay and Jura and seafood to die for all make this relatively new long distance walk a classic in the making.